This is easily the most productive pattern I fish here in northern New England. Size 14. Quick, and simple to tie can fish them hard and not worry about loosing them. 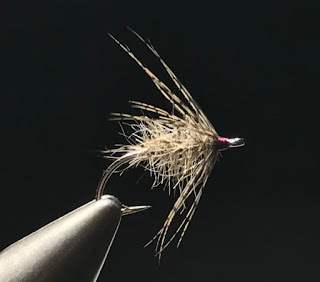 I also find a sparse bit of clear/white Antron or Emerger yarn tied in as a tail and then pulled over the body with a little slack and bound behind the hackle fishes really well on bright days when the fish are down low and reluctant to feed. You can change the body color and the "shuck" to match naturals if you wanted to get a more "match the hatch" pattern. The more sparse the more fish. Jay, sounds like a great idea to cover a caddis emerger. I love these Alec Jackson soft hackle hooks, I just wish they made them in black or bronzed. I think the brightness helps some days and spooks fish others. Brook Trout - Thanks, I often think of your beautiful soft hackle flies when I tie them.